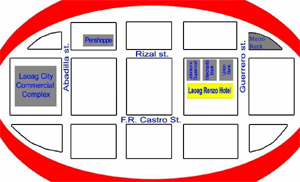 Laoag Renzo Hotel | Promo | Accommodations | Amenities | Facilities | Online Reservations | Visit Ilocos! | Explore Philippines | Guest Survey Form | Feedback | What's Up? | Contact Us! Laoag Renzo Hotel is conveniently located in the heart of Laoag city. It is just 5 mins. walk to the Laoag Commercial Complex. It is also located near major banks.